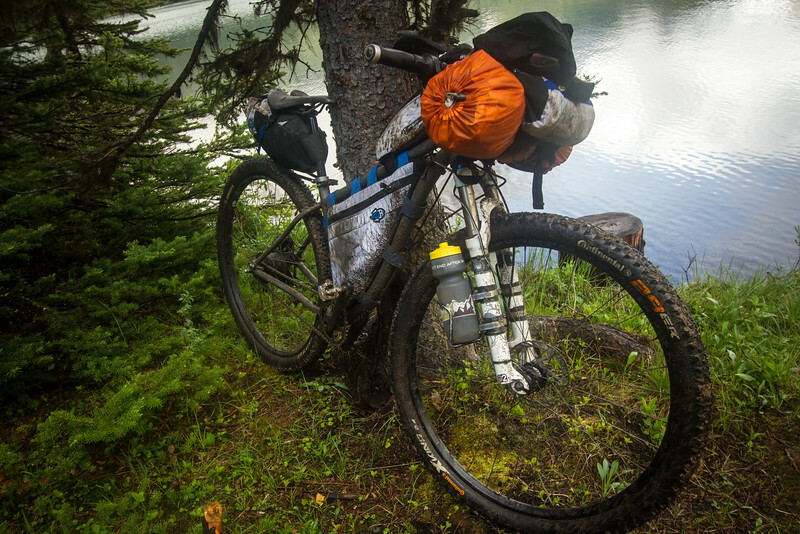 After waving off Jackie and the rest of the Tour Divide crew in Banff, I was on a mission. 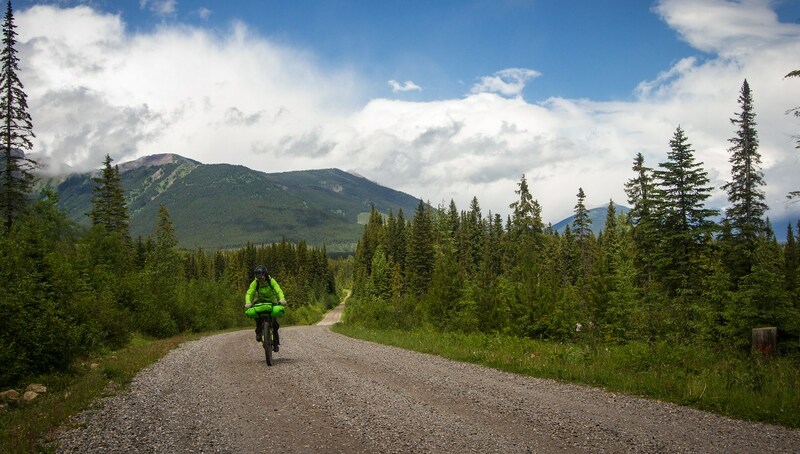 I had to get back to Canmore and get my bike packed and ready to cycle out of the house by the time Kate arrived. Thankfully, Kate was running late, as I had done the bare minimum when it comes to prior preparation. Less thankfully, it was starting to rain. 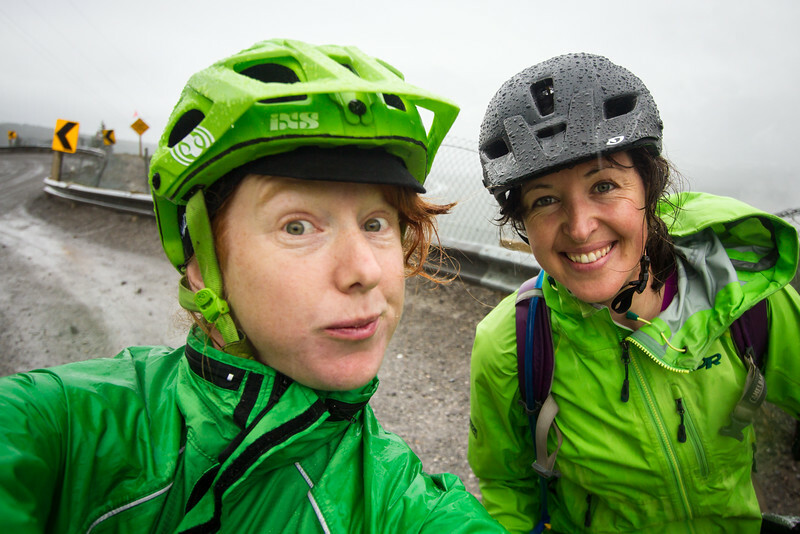 I helped Kate with the logistics of getting her bike packed and ready for her first overnight bikepacking adventure, and then we set off into the dubious weather outside. Leaving Canmore, we stopped at the top of the pass for photos, and to say our last farewells to phone reception. Turning south, the soggy wilderness beckoned. The rain was pretty relentless. Spray Lake Road holds up pretty well to rain though, and we generally didn’t have to ride in actual mud, although we were being liberally coated with a fine layer of grit. We were looking forward to reaching Engadine Lodge, where we would start meeting up with the Tour Divide racers who had set off that morning. Sure enough, not long after reaching the lodge we ran into a man stopped at the side of the road. It was Michael Row from Vermont, not having the best time in the rain, and happy for a chat. 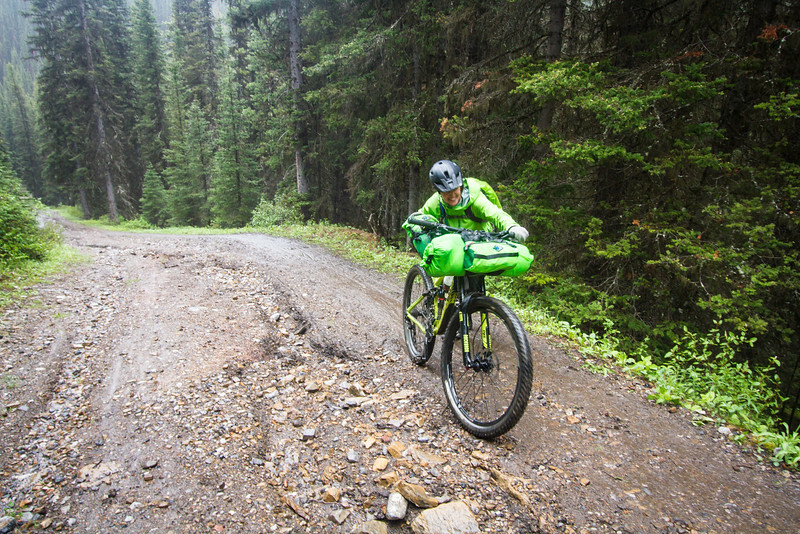 Between there and Boulton Creek shop we ran into a few riders, but at the little shop, we hit a huge cluster of wet and slightly dispirited riders. Quite a few were talking about stopping for the night. 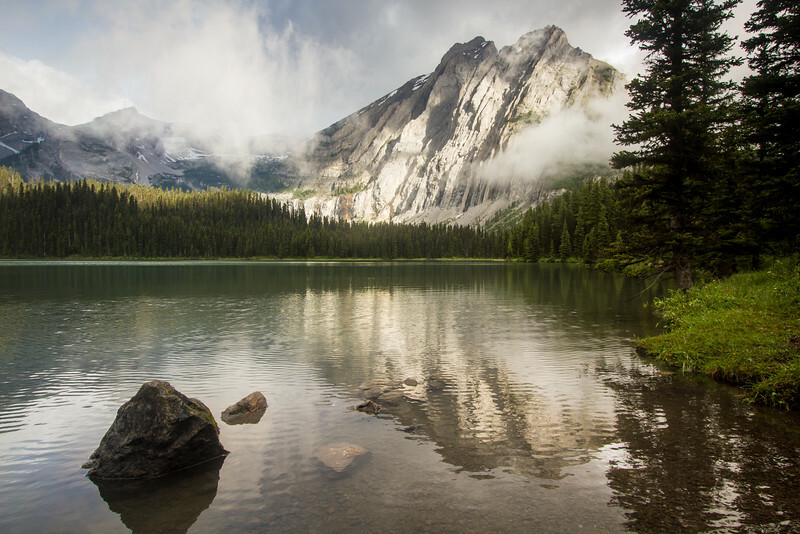 It was almost easy to get sucked into the idea – people were talking about how wet and cold they were, the need to dry out, the danger of bears. But Kate and I had plans to make it to Fernie tomorrow, and so we resisted the urge to stay with the pack, and kept moving. Leaving the warm store in soaking wet gear was a good way to start feeling really chilled. Thankfully there was some good solid climbing ahead of us to get over Elk Pass. As we got closer to the top of Elk Pass the rain even lightened a little. For a while, we even suspected it might not be raining, but careful examination of the air confirmed that it was indeed still full of water. The descent to Elk Pass was not too tricky, and we were soon down the other side, rolling past the Elk Lakes Cabin and eyeing the warm and jolly interior wistfully. But it was only a couple of kilometres further to the campsite. And then the rain stopped! 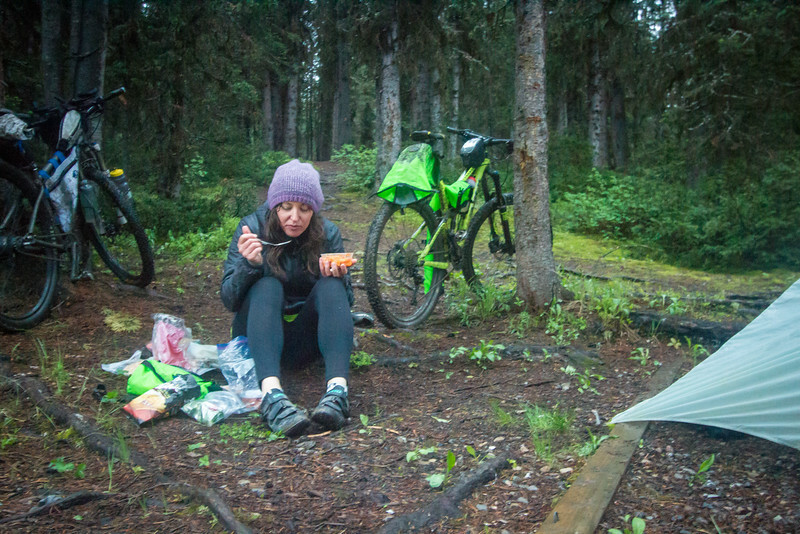 We had the campsite all to ourselves and enjoyed sitting on the ground in warm clothes, eating a cold dinner. With the exhaustion of a long day behind us, we retired to the tent early – the night was largely dry and uneventful, and I actually slept pretty well. The morning dawned fairly clear and rain-free, making it easy to get organised and packed and out of camp in good time. As we drew near the cabin we rolled past some of the inhabitants, out collecting water from the creek. I caught a glimpse of one of them, and had one of those ‘Hey, that person is familiar, why are they familiar?’ moments. The question was immediately resolved when I spotted my friend Tanya a few seconds later. The hut was full of families I knew! Tanya and Mark, and Suzanne and Paul from our Elizabeth Parker hut trip, as well as another family I hadn’t met. We chatted, lamented the fact we hadn’t thought to stop in at the cabin the night before, they topped up our water, and then we set off towards Fernie. The road from Elk Lakes to Elkford is fairly straightforward. 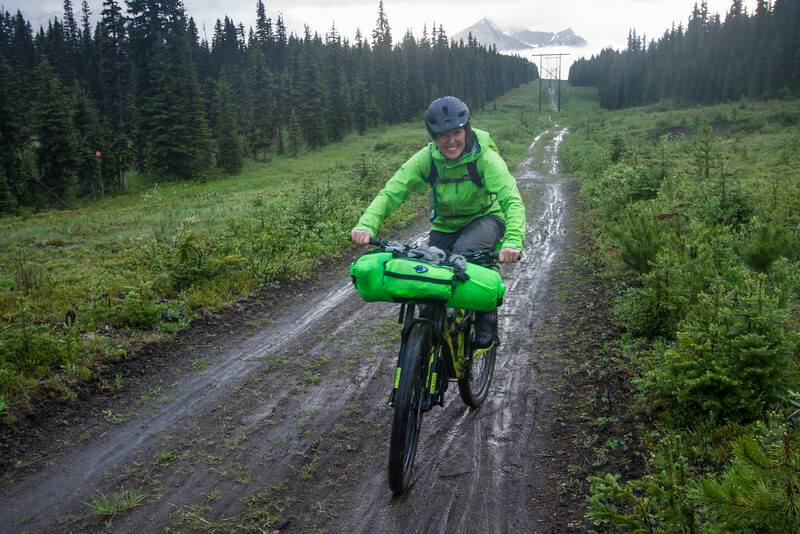 Big rollers, a beautiful wide open valley, and on this day it had sprinklings of Tour Divide riders, as well as sprinklings of rain. The weather never really got properly nice, with rain squalls constantly blowing across. 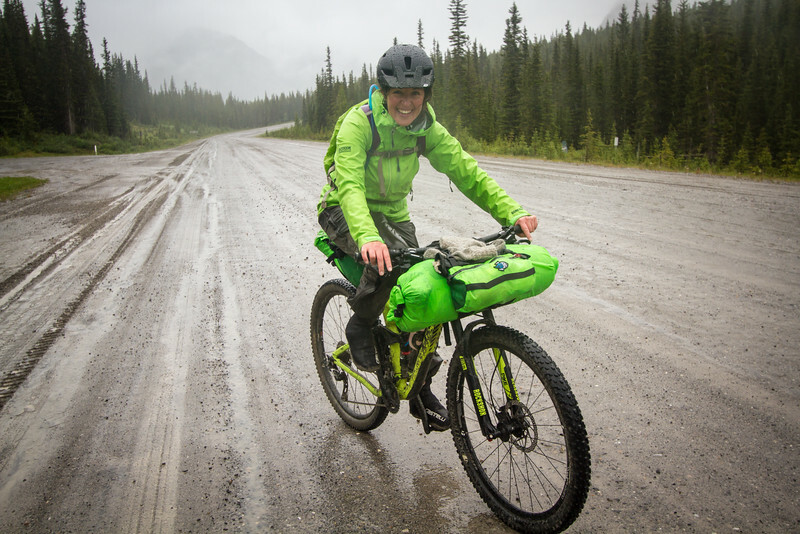 For someone who has never ridden a bike as far as 136km in a day, let alone a loaded down mountain bike, Kate remained remarkably cheerful. 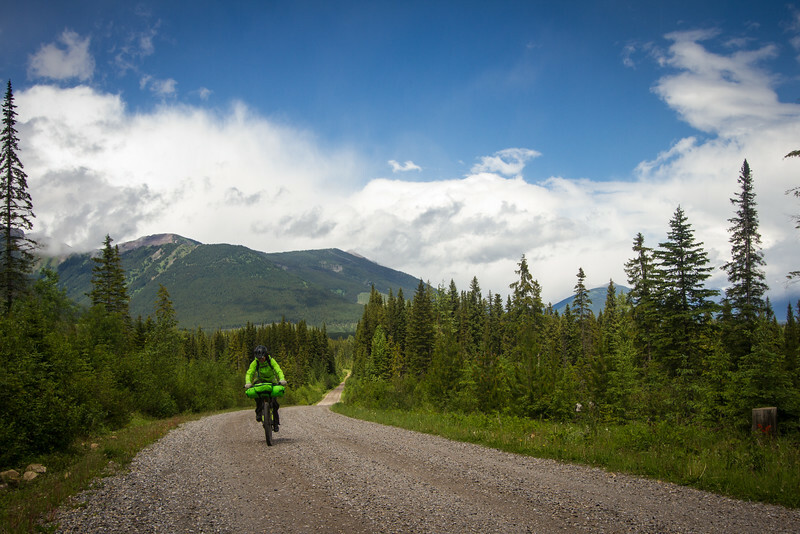 But by the time we hit the final 20km leg into Fernie, she was fading. A massive day behind us, we made the final crawl into Fernie and rode straight to a pub for a 9 pm dinner of burgers. It was hard to decide which was more delightful – the food, the warmth, or being able to sit on something that wasn’t a bike seat. Thanks for the adventure Kate, you rock!